My mom's Applesauce Muffins are one of my all-time favorites. And there isn't even chocolate involved, which speaks volumes for their insanely delicious flavor. Last weekend I woke up craving them, but since I had already shared the recipe with you, I decided to be adventurous and modify. It was a really, really good decision. Preheat the oven to 400 degrees. Cream the butter and sugars in a bowl with a standing mixer. Add in the egg and vanilla. In a separate bowl, combine the flour, soda, and spices. Add to the butter mixture, alternating with the bananas. Mix in the applesauce. 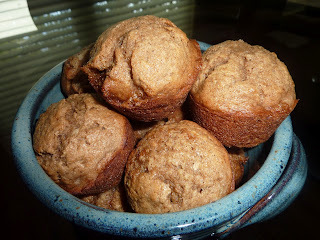 Pour the batter into greased muffin tins (or lined), and bake for 13-15 minutes. Eat immediately with coffee. Or chocolate milk.